There are several reasons that make XAT a unique exam. The marking scheme is unlike any. Surprise elements galore, as with the decision of XAT 2019 not having the essay-writing section. While the cut-off for XAT never goes too high, it could be because the difficulty level is genuinely top-drawer. This also creates the situation where single topics affecting only a few questions could propel up or even slide down one’s percentile. The result calculation too gets tricky as GK is not counted during the cut-offs, but is an important segment for the final selection. The marking scheme can also vary across question sets. Here, certain questions carry greater marks, and subsequently more negatives too. In fact, for some questions, leaving something unanswered can lead to greater penalties than not attempting at all. But nonetheless, all this apart XAT is a top exam to attend, as it paves the door open for several of the most prestigious institutes in the country, especially on the eastern side. The most unique aspect about the XAT exam though is the decision-making section. 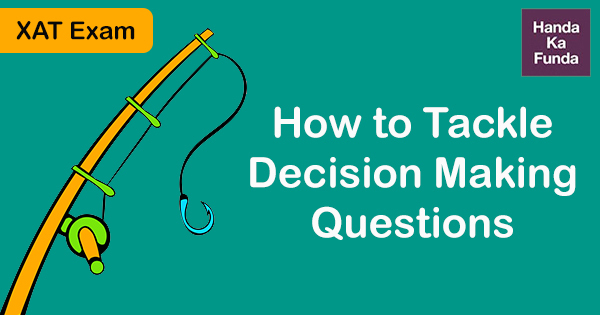 Decision-making is a mix of several areas of expertise. It involves both analytical and logical reasoning, plus the patience to read through, just like reading comprehension. Beyond a question with an answer, this section literally tests the managerial skills of candidates. The behavioral aspects also get tested here. Even ethical and people-based questions are fairly common. Such questions carry a lot of data, so deep analysis is needed. Sometimes, the best idea is to simply leave these sorts of questions. Instead of spending too long a time on them, it makes sense to quickly scan through the question in the end. The managerial ability starts being tested from here as the candidate has to decide whether to pursue the full question or not. The smartest way to prepare for this section would be to go through past years’ papers for such questions. Decision making questions have been a constant fixture last couple of years in XAT, so students won’t need to look too far back. The point remains as mentioned already that XAT is a low scoring paper, so completely neglecting a topic can lead to a tremendous slide down in percentile points. Keep aside personal opinions as one must avoid taking any side in particular. There will be certain options which will be emotionally appealing. They have been inserted on purpose to confuse the test taker. So, avoid making unsubstantiated judgments. Identify the stakeholders for whom the question is being asked. One has to analyze who benefits and who does not in this entire equation. The problem has to be dealt holistically from the viewpoint of each stakeholder. Look at the Bigger Picture- certain stakeholders could get damaged in the correct verdict. But if this small amount of damage, brings overall greater benefits, then so be it. One has to maximize the benefits and reduce the damage towards the end goal. However, in this process, no unethical options must be selected. Since this is in microcosm a test of managerial abilities, remember no exam will ask one to purposefully adopt such unethical practices. Attention to Detail- this is probably the most important aspect of this entire exercise. Managers need to spot the tiny details, and so before wrapping up this section, the candidate must check whether he/she may be missing any aspect. These tactics must be kept in mind by the students when attempting the decision-making questions for XAT. On online portals such as HKF, a great number of questions can be practiced. Ultimately, whoever is good at logical reasoning and reading comprehension, should be able to solve this section with aplomb.